I was looking forward to checking out the EOS Wireless iPod Speaker system. With all my music on my iPod, I wanted a complete solution for playing music in multiple rooms without having multiple iPod docking speakers. Does the EOS fit the bill? Read on! First, the EOS cost $249.99, but that price is for the base station and one satellite speaker . 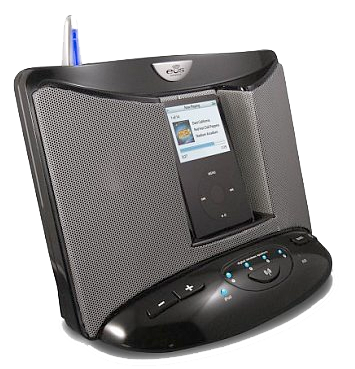 The base station is an all-in-one iPod dock and speaker system that produces decent sound. I say decent when I compare it with the JBL SoundStage 400P that I recently reviewed with Mark Rudd on our weekly MyMac.com Podcast (#242 here http://www.mymac.com/showarticle.php?id=3674) The JBL SoundStage 400P sell at the same price-point, $249, but sound much better. In fact, if you don’t need a multi-room iPod speaker system, I would recommend the JBL speakers over the EOS 100% of the time. The difference in sound quality is apparent even to non-Audiophiles. Still, many people have a need to wirelessly send their iPod music around the house, and while there are a few other solutions for doing so, none come within the price-range of the EOS. The base station controls all the music, and you can buy additional wireless speakers for $129.99. They run on AC power only, and use a pretty innovative power plug that either connects directly to the speaker, or can be pulled out and used with the built-in power cord. 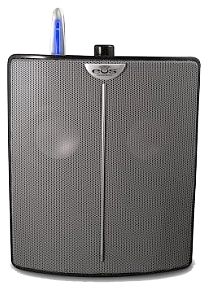 While this system works well, it is unfortunate that the remote speakers don’t have an optional battery solution, so that you can take a speaker out into the yard for wireless music without dragging an extension cable along with you. I understand that combining wireless capabilities and playing music would be taxing on a battery, the fact that I don’t have that option is limiting. The EOS can also work with the iPhone, although it is not officially supported. You can connect up to four remote speakers to the EOS base station. Setup is a breeze, and in fact this was the easiest setup for any wireless product I have ever used, save for my iPhone. It really is simple, which is a big factor if you are thinking of giving these away as a gift to a non-tech person. Another really great feature of the EOS is its AUX input. Yes, I know almost all iPod speaker systems have an AUX jack. But with the EOS, you can use the AUX input to route the audio from your Macintosh into the EOS, and then send that audio to any of the remote speakers. So rather than just an iPod speaker system, the EOS can work as a wireless speaker system for your Macintosh. Combine that with the Remote App on your iPod Touch or iPhone, and you have a pretty powerful wireless audio system in your home. For me, the simplicity of the wireless setup and the innovative power cabling system is a winner. I also like the overall design of the unit as well. But the audio quality is simply lacking. EOS has taken the complicated and made it simple, but at the expense of great audio quality it seems. I would like to see them team-up with a company like JBL or BOSE to provide their networking technology with a company who does audio better. Low end bass is flat and cracks at higher volume, while the mid sounds decent but nothing spectacular. Overall, I like the EOS Wireless iPod Speaker system, but until they up the audio quality, it won’t be a perfect solution for me. Run Windows on your Mac without rebooting! Parallels Desktop 4.0 for Mac provides the complete suite of essentials to run Windows on Mac the easy, fast and powerful way.